Each day, millions of yoga enthusiasts flock to yoga studios for their daily or the weekly practice, celebrating an ancient wellness tradition as well as a form of exercise and therapy that’s been validated in many studies by modern pain science. If done under the guidance of a skilled instructor or therapist, it can bring several health benefits that help people cope with conditions including anxiety, depression, chronic pain, high blood pressure, osteoarthritis, and chronic stress, something that all of us are exposed to on a daily basis. 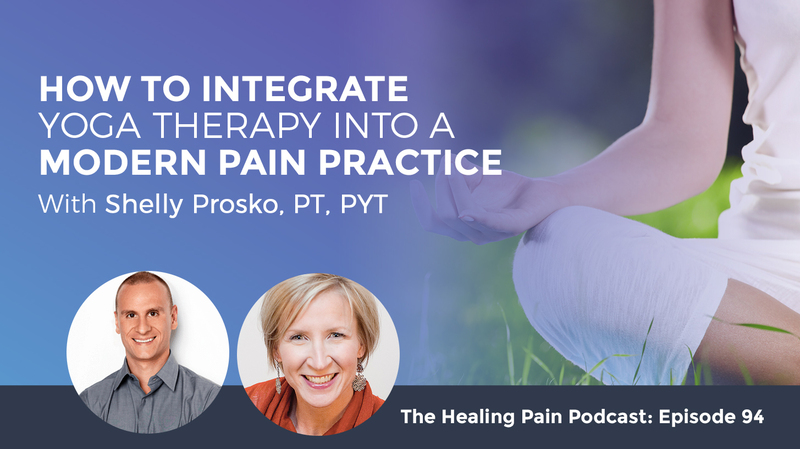 If you’re a practitioner who treats patients with pain, Shelly Prosko says you can integrate yoga therapy into your pain practice. Shelly is a physiotherapist and professional yoga therapist who is dedicated to bridging the gap between yoga and modern healthcare philosophies. Learn how you can integrate yoga into your physiotherapy treatments to create and sustain optimal health. How many of you have tried yoga or yoga therapy if you struggled with chronic pain? If you’re a practitioner who treats patients with pain, have you tried yoga yourself or more importantly, have you taken a yoga therapy course and figured out that this may be something you can either integrate into your practice or something you can encourage your patients to pursue on their efforts to living a full life beyond pain? Each day, millions of yoga enthusiasts flock to yoga studios for their daily or weekly practice. 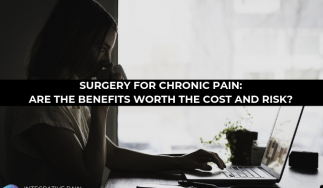 When they do that, they’re not only celebrating an ancient wellness tradition, but also a form of exercise and therapy that’s been validated in many studies by modern pain science. Yoga with this combination of physical postures known as Asanas, breathing techniques known as Pranayama, and relaxation and meditation techniques known as Dhyani, are rooted in science. If done under the guidance of a skilled instructor or therapist, it can bring several health benefits that help people cope with conditions including anxiety, depression, chronic pain, high blood pressure, osteoarthritis, as well as chronic stress, something that all of us are exposed to on a daily basis. Here to speak with us is Shelly Prosko. Shelly is a physical therapist, a yoga therapist and an expert in integrating yoga therapy into traditional practices such as physical therapy or other types of primary care. Shelly has utilized yoga methods and the philosophy in her physical therapy practice for over two decades where she has worked with people who have suffered from a variety of musculoskeletal conditions, neurological problems, pelvic health, as well as many persistent pain conditions. Her mission is to educate and empower people to create health, utilizing her own method called PhysioYoga, which has influences from both physical therapy as well as traditional yoga. On the podcast, we will discuss pain relief and pain management as it relates to yoga therapy. We’ll discuss Shelly’s own journey and exploration of integrating yoga into a physical therapy practice while being mindful in connecting to the breath is vital for pain relief, how you can integrate yoga therapy into a physical therapy or other pain management practice, and of course her own method of PhysioYoga, which you can find more about by visiting PhysioYoga.ca. If you’re new to the podcast, it’s a pleasure to be spending this time with you and thank you for being here. Let’s get started with my good friend, Shelly Prosko. Shelly, welcome back to the podcast. Thanks for having me. It’s good to be back. Do you remember when you were on first? I remember I was the first on this podcast and it was number one on your entire show. How does it feel to be number one? Everyone always wants to be number one. It was fun just to be with you into it. That was the first time we had met so it was cool. That was on May 10th, 2016. It’s amazing how far Pain is coming, isn’t it? Yes, it is. Just to even see what I’ve learned myself in the past. I should have listened to that episode too, to see how much I’ve changed and learned but I know that I have. Take me on a little journey of your learning because you are a licensed physical therapist or a licensed physiotherapist as they say in Canada where you’re based, and you’re also a professional yoga therapist. What came first? The chicken or the egg? I started yoga first, so that was around 1990. I started reading a yoga book that my sister had. I found it in her bedroom when I was snooping in there. I just started doing yoga through that book and then I started taking yoga classes so that was in the ’90s. Then I got my Physical Therapy degree in 1998 and so pretty much right away I started integrating yoga into my physical therapy practice. Back then it was more about the postures, the movement. I didn’t know much else as far as the meditation and even some of the breathing. I’m much more in-depth with those aspects and even yoga and philosophy now. Back then it was more just the poses and saying, “I think this pose would fit well with this patient or this patient.” As time progressed, I started to get more and more formal yoga training, so the yoga teacher training, yoga therapy training. That’s a short summary of how it went in the beginning. Back then when I was a student, I wasn’t thinking about integrating yoga that much. I was more focused on getting through the day and the school and it was very stressful. I don’t know I was just more practicing yoga. It wasn’t until I was out in the workforce in 1998 then I started just to integrate on my own. I didn’t talk about it to my friends and professors but with that said, when I started integrating it into the workforce, my first job placement was that a long-term care facility. Shortly after that, I switched to an outpatient orthopedic setting. I was on my own and I didn’t talk to anybody about it. I would integrate different poses here and there and it was okay. I wasn’t too stressed about it but as time went on I started learning more about yoga, more about the benefits for myself, like using the meditation and the breathing. Then, I started to get a little antsy and a little bit hopeful in that this would be good to use but also frustrated because there was nobody that I knew who was doing it. It didn’t even seem an option and I don’t remember how it all came together. I started to get antsy and frustrated like, “I can do more. I hate some of this stuff but you know might be helpful here.” As the time went on, I started to take formal training in yoga therapy and I started meeting other healthcare professionals and physios that wanted to do this or that we’re doing it but in a different way. Over the years, there’s a bunch of us now and we’re like a little group and it’s great. Of course, the movement aspect makes sense. It fits in perfect as a physical therapist or a physiotherapist because we teach people how to use movement as a way to heal themselves. There are so many different things in yoga. What came next was, “I’m using the movement with patients. It’s working. They like it. I see them getting better.” What is the next piece of yoga that you brought into your practice? The ancient wisdom of yoga is it’s all connected. You can’t separate the body from the mind, from the breath, emotions, spirit, and energy. Before I answer that, I just want to remind everybody that we tend to speak in those terms like there’s the movement, the breathing, the meditation and a lot of it is internally woven. It all happens together but this is the easiest way that we can explain it. Even back to the movement piece for a moment that has evolved. It’s not just movement, it’s how you’re relating to the movement. It’s the awareness during the movement. It’s the interoceptive awareness during the movement. It’s the meditation during the movement. It’s the breath during the movement. Just to be clear on that but the other aspects to yoga are there’s the meditation peace, which can be mindfulness meditation practices. There’s also awareness practices and there’s a whole host of different areas of awareness practices. You can do an awareness of thoughts, emotions, breath, body, etc. Even energy and spirit, there are different methods we can do there. There are different breathing practices in yoga and we call it Pranayama, but it’s not directly defined as breath practices per se. Pranayama means more extension or control of the energy and the body. One definition I like by two physioyogis in Australia: Bianca Machliss and Simon Borg-Olivier, they talk about Pranayama making the most effective use of the air that we breathe and the Prana that we absorb. Prana is like energy. That is one aspect of yoga and we use the breath and different breathing practices as a tool to make the most effective use of the air that we breathe and the prana we absorb. As a physio, we learn about breathing and breathing techniques. 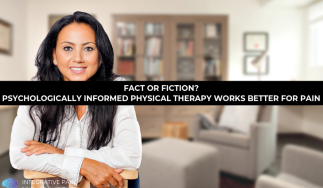 A lot of physical therapists work in adult rehab or respiratory therapy clinics, so they are involved in that part of care. It’s not something that traditionally has spilled over too much into outpatient. It does a little bit more now, but why should a physio or someone with chronic pain learn more about the breath and breathing? It’s all about the breath. I remember that I was told early on in the ’90s and in my yoga practice and each year, each decade, I started understanding more what that means. First of all, we can look at all the different aspects of the breath. Let’s look at the biomechanics, anatomy and the physiology of breath. For physical therapists, that is key. We have our muscle, the respiratory diaphragm that’s our key central muscle. For our core strategy system and core efficiency, the efficient movement comes from that central muscle. Then we have the pelvic floor which works in conjunction with the respiratory diaphragm. Together they’re moving up and down with breath. If you’re not breathing efficiently for the task that you’re doing, that’s going to affect your whole movement. Mary Massery, a very predominant physiotherapist and educator says, “If you can’t breathe, you can’t move.” Biomechanically, it’s so important for balance reactions and things like that as well. The breath too can influence our energetic level. It can influence us at the level of our nervous system. If we are holding the breath or if we’re breathing more of these upper accessory neck muscles throughout the day, that can feed more into that sympathetic nervous system, the fear or fright flight system and that can influence pain and even by mechanically that can influence the rest of the system in the body. It’s such a cascade of events that can happen if you’re not breathing efficiently for the task that you’re doing. We also have emotions and thoughts. There have been some studies where certain breath patterns can influence your emotions. Philippon did some cool research where they had different emotions elicited in different groups of people, happy, joy, sad, anger, fear, anxiety, and they had people who observed their breath pattern and wrote down these specific breath patterns like the breath rate and how they’re breathing in the body and different things like that. They had a whole other different study and they have different groups of people where they made them breathe in these certain patterns that were recorded and sure enough what they found significantly were the emotions induced were the same. It reminds me of my recent reading, a study about Botox. This is a funny connection. When people have Botox, their facial muscles no longer move when they get angry. They don’t get as angry because of the facial muscles obviously feedback and input back to the brain. Just like when you breathe in a certain pattern, most respiratory diaphragm muscles send input into the brain, so they inform. It’s interesting how nothing gets people at Botox, but you are in some way disrupting a long connection that’s been there for many centuries so to speak. That’s what I love so much about yoga. This is what yoga has been telling us. The ancient wisdom of yoga is all connected. You can’t separate the body from the mind, from the breath, emotions, spirit, energy so when you are in a certain pose or position, maybe a forward fold or a backbend or the corners of your mouth are turned up or turned down that can affect your thoughts and emotions. We have some research that is supporting this and then of course back to the question that you had about the breath, that we’re starting to see as well. That different breath patterns can influence the physical part of our being, the mental part, emotional part, energetic part and can influence pain. It’s interesting that the yogis and the Buddhists knew the four foundations of mindfulness. The first foundation of those four is mindfulness of the breath. The mindfulness of breath carries all the way through all four of those foundations, and all the way down to if you know Buddhism’s The Eightfold Path is still included in there. Breath is the anchor through all those foundations. The question and the challenge that I have for you is how do we move more physiotherapists to use the breath as that first step like they do in Buddhism or yoga as part of their clinical practice? That’s what I teach both. There are many different ways, but we can start to think about breath awareness practice and becoming aware of the breath. That’s something that any physical therapist can do with their patients. It’s completely within our scope of practice. Just becoming aware of the breath, taking even one minute to guide your patient through the different qualities of breath, ask them to check out the rate and rate of the breath or the length of the inhale and the exhale, how deep it is and different aspects. I started integrating yoga into my physical therapy practice, but back then it was more just about the postures and movement. Can we do something a little experiential? Sure. I was hoping because it’s hard to explain it. It’s hard to explain breath because you can’t see it. If someone with pain or if a practitioner is out there and they want to guide their patient in a one-minute awareness of the breath, how would they do that? You can have your eyes opened or closed. It doesn’t matter. Sometimes closed helps, but whatever’s comfortable. Get into a comfortable position sitting where you are if you like or maybe lying down and become aware of the breath. Try not to change it. You don’t have to do anything to it just notice it and notice the depth, the rate, the length of the inhale compared to the length of the exhale. Notice if there’s a space or a gap between the inhale and the exhale or if it’s continuous. Notice any qualities like if the breath is bumpy, rigid or smooth and notice how the breath is moving in your body, some of the areas that are obvious and then maybe some of the less obvious areas, the subtler areas that you feel might be moving and timing with the breath or even pulsing. Then you can open your eyes. I could make that a little bit longer, but the nice thing here is how I ended with how the breath is moving in the body and then you have the person in their body. As a physical therapist, you can start to then work maybe to a short body scan or start to look at holding tension. You start with that breath and often what happens is the person can see different things but they can see maybe where there is some tension where they maybe otherwise wouldn’t have. What’s nice about that is if you’re working with someone who has chronic pain, oftentimes they’re very scared, tensed, fearful and working on their breath is something that’s approachable for them. Some PT clinics you walk in, there are equipment and treadmills and heavyweights around and they’re not sure what to expect. Instead of jumping first to a therapist, you may want to slowly walk into this. I’d like to point out what I believe the biggest challenge or the biggest obstacle to offering someone a breath awareness practice. Do you know what I think it is? I would say there two depending on the therapist. The first is a lot of therapists want to fix things and the breath is this you can’t put your hands on it. You can’t manipulate it. You can manipulate it, but you can’t manipulate it with your hands so to speak. Then the other is that to teach people awareness of the breath, you have to have worked on your own awareness of the breath first. Am I right? Am I wrong? There’s no right or wrong but I resonate with what you say. In my experience, the biggest challenge and the biggest obstacle is the practitioner. It’s the physical therapist because I get the question all the time, my patients, that we’re not going to want what they want. They’re paying me all this money. I have fifteen minutes with them. I’m not going to come through but I work in a busy outpatient orthopedic setting. Yes, there isn’t enough time so the model I work in now. I spend more time with people, but even back then one to two minutes, I have not had one patient in my twenty years that has said, “I don’t breathe stuff.” If I spent fifteen minutes all on breath, like in that outpatient setting where they were, “That’s different,” but I’m just talking about anchoring, settling, centering, and everyone appreciates it. No one. The typical physical therapist in the clinics isn’t doing that with people. When you do that with someone with just a couple of minutes of centering and anchoring with the breath, I have only found positive responses and then exactly what you said. The challenge is that the practitioner hasn’t tried it themselves. Absolutely this is the stuff that you have to practice on your own and then it helps you with your language and you’re chilling. You can’t take a course and read it in a book then just do it. When I first started teaching mindfulness of the breath to patients, I couldn’t believe how exhausted I was after one or five minutes of teaching them because my breath needed to be worked on more and more. It’s the thing where you can go deeper and deeper year after year and it never gets old after a while. Why is the breath so important for a woman’s health or a pelvic health physical therapist knowing that you’re a women’s health expert and those types of patients who are coming into the clinic? The breath is key there. It is one of the factors that influence how well the pelvic floor can function and performance roles. The pelvic floor plays roles not just in our bowel and bladder, but also sexual function with production and also things like the pelvic floor play a role in that core strategy system, core stability and core efficiency. Also in spinal health and hip health, even our standing balance reactions. The breath is important because the respiratory diaphragm sits as a dome up in the ribs and the pelvic floor sits below the pelvis at the bottom. The pelvic floor is attached to the sides of the pelvis, the tailbone, the coccyx and the pubic bone at the front. There’s a bunch of layers and it’s a little more complex than that. Basically, the pelvic floor sits at the bottom and it is irregularly shaped of a dome as well. The respiratory diaphragm and the pelvic floor when we breathe in, when we take an inhalation, they both go down. The pelvic floor moves as well, it goes down, it winds and expands on the inhale. Then when you exhale, they both recoil and they go back up again. Back to that question of why is the breath important for the pelvic floor is because without that nice timing of the respiratory diaphragm and the pelvic diaphragm or the pelvic floor, the pelvic floor can’t perform its functions as optimally as it needs to. Pain Science can be super technical. You can get a PhD in Neuroscience and specialize in Pain Science to get on the level of receptors, neurons, neurotransmitters and pathways. It’s like this iceberg underneath it is all the things we’ve learned about Pain Science. The tip of the iceberg is what you need to share with your patients. How can PhysioYoga or how can a good yoga therapist inform better Pain Science and better pain care? One of the things I would say as far as education goes is for any physical therapist who’s looking to integrate yoga into their practice or any yoga practitioner, yoga therapist who’s wanting to use yoga to help people that are suffering from persistent pain. I do think it’s important for that person to learn more about pain neuroscience, pain neurobiology and take some course or continuing education. You’ve had Neil Pearson on your podcast before. I’ve talked about him before. I’m biased to his information because it’s phenomenal and it’s something out there that there’s not anything like it in that. 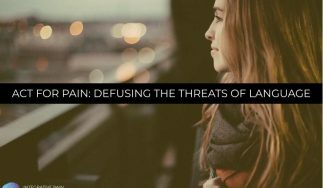 He talks about the Pain Science and you get a nice grasp of some of the deeper layers of the Pain Science, but then also how to translate that to your patients and how to use the different yoga techniques. The challenge is that the practitioner hasn’t tried it themselves. This is the kind of stuff that you have to practice on your own and then it helps you with your language. We have a webinar too online and the alumni together. It’s valuable because it does give you that information and then some practical ways to translate that. You had Lorimer Moseley on this podcast and I had a chat with him too as well. One thing that he told me, and I think you mentioned on your podcast too, is it’s so important for us as practitioners to have a deeper understanding of that Pain Science even if we’re not sharing it with the patients per se. To answer your question, I would say the practitioner has to get that learning from somewhere and then how to translate it to the patient. That’s tough to comment on because that’s a whole course, that’s what we do on how to do that. In short, I’ll give you one tip and it’s not always through words, that pain education that we talk about is not always something we do to someone. What it can be is using these techniques of having someone be aware and be inquisitive and have self-inquiry and duties, awareness practices as they are doing these different movements or doing the breath practice. It’s through those experiences that you give the person or that the person has that they can then understand, that’s what Pain Science is so you give them an experience. It makes me think about the traditional yoga instructor though, who I’m sure is finding your work and finding your great courses. How challenging is it for them? They don’t have a science background. They’ve gone through either a 200, 300, 600,000-hour yoga training and all of a sudden, their brain is being awakened, for lack of a better word, to this whole other field of science that has an important impact on how they’re teaching their classes and working with their clients every day. The yoga therapist has many hours of training. They have such a great foundation already. What I mean by foundation is they’re already open to these concepts of the mind, the spirit, the body and things all influencing one another. They’re quite open. It makes sense to them. In my experience, when I teach courses and workshops to yoga teachers and yoga therapists, it’s no problem for them to grasp these ideas. They have a lot of skills, especially ones that have been training for a while. The language and the skills that they have to help people connect to their breath or connect to their body or connect to their spirit, they’ve got a great toolbox. Do you find it easier than working with a physio that’s been out practicing for fifteen years and has done a lot of the more manual biomechanical type of courses and now they’re starting to dip their toe in the water on the other side? It’s a generalization, but yes. In that the part that’s easier is having that person learn those techniques and the language but that would make sense because the yogi has had training in that. The physical therapist who hasn’t maybe practiced yoga or had training in that, they’re not going to be as skilled in that or even intuitive, but much depends on the person too. Some people are more intuitive with those things. Tell me about some of your projects you have going on because I know you’re always a very busy person traveling, teaching, giving lectures and attending conferences. What’s new on your list? I’m focusing on book writing. Myself and a professor at the Maryland University of Integrative Health, Marlysa Sullivan whom you’ve had on this show as well and Pearson, so the three of us are coediting and coauthoring a textbook on what we’ve been talking about. The title is Yoga and Science in Pain Care: Treating the Person in Pain with Singing Dragon Publishers. I’m working on that in the chapter I am. I’m going to get right back to it when we’re finished in The Case for Compassion and Pain Pair. I want to be on your show again and talk about the science surrounding compassion and how that can help people in pain. That’s where my heart, my mind and my energy is. I’m also still touring around and teaching courses. You can find that on my website or my calendar. I have a couple of questions for you. The first one, what is missing from pain care as you see it? What’s missing from pain care is the understanding of the contemporary Pain Science. We are stuck in that old Cartesian dualistic model. Even though we may think we understand, I hear it all the time in my own language and in my own words, we’re still stuck in that mind and body that we’re separate. Even you can see that. That would be the one thing we still need to learn more about contemporary Pain Science and what it’s saying. That’s the first thing I think is missing in pain care. The second thing that is missing in pain care because it’s what I’m reading about and the research is telling us this too and it’s compassionate care. We’re not the blame on the practitioner. I don’t mean that it’s the practitioner who is not giving enough or showing enough compassion or compassionate responses but the self-compassion as far as the patient goes. Compassion I think is missing on behalf of the patient not giving themselves enough compassion, the practitioner not giving themselves enough compassion for not being able to help the person as much as you want or not having enough time and then just compassionate care of the practitioner to the patient, to the person in pain. Research does show that seems to be missing. There are lots of different barriers though because of that. It’s not just because you’re not a good practitioner there are restrictions in that. How has helping patients with pain changed your life? It’s helped me listen to people more. I spoke about on my group call about a patient that I treated many years ago when I was a very young therapist and didn’t know as much. Can you describe the one patient that when you look back on, you wish you had the skills you have today so you could have helped them more? I know it’s a tough question to ask a practitioner because we want to help people at the deepest level. We know so much more now than we did twenty years ago when we started practicing. There are lots and I wish I would have listened more. That’s the skill. Listen, just listen. Who’s been the greatest success story of your career? What patient comes to mind with that? Someone who was very hopeless, depressed and had back pain for twenty years and had five surgeries. I worked with this person for several years on and off. I saw this person early on when I didn’t know as much and this person didn’t know as much. We’ve grown together. This knowledge that I’ve had, I feel like I’ve grown exponentially in the last five years and learned so much. I’ve had the pleasure of imparting that with this person and this person has also learned and helped me. The success story is with all of this and yes, it’s the integration of yoga, the integration of yoga philosophy, finding purpose, meaning and looking at this person’s values and bringing it all together. This person is doing things that I never ever would have thought, spending time with grandchildren, walked daughter down the aisle, hunting and fishing. I could go on and on but doing things that this person never did ten years ago had to quit it all and I would say has this steadfast join now keeps me going. Shelly, you also have something called WOW Chats. You turned the camera at cool opportune moments on physical therapists and other Pain Science people who are into pain and helping people who do some really amazing work. You have these grades between three to ten-minute segments, they’re super powerful. You get two minutes now to turn it on me and ask me maybe one or two questions like a WOW Chat? I want to do the WOW Chat with you. That’s why I said I needed to come to New York because I have made a vow to myself that I’m only going to do these WOW Chats in person. I’m still going to ask you the question. I want to do a WOW Chat with you in person so when I’m in New York we’ll do it. Joe, I would like you to share with everybody what do you think in life talking about work with your patients in that, but also with yourself and in general. What matters most to you? At the end of the day, what matters most to you? What matters most to me is when I look back on my day, my week, the last couple of months or my year, that I have the things I’ve done in my day have been in line with the things that I value in life. I know if I’m acting in a way that is in line with the things that I have respect for and admiration things I value then generally, somehow, things tend to fall in place. I’m happier and I’m more fulfilled. If I let other people’s values cloud my own or I let other people’s ideas in the way they should be, cloud me and influence me and oftentimes we don’t realize this happens. That’s a WOW because you’re basically what I’m hearing. Your WOW is an act, think to act in line with your values and when you’re not in line and when you’re not acting or thinking or in line with your values, then you’re not living with ease. You’re not on that path. I can take you one little layer deeper into that though if you want because I’ve thought about this a lot recently. I have a mentor whom I work with too who asked me a couple of questions about this topic. He said to me, “What separates your values from other people’s values?” I said, “Some of us have shared values like both you and I.” Shelly, share the same value that we like to be in service for people, that we like to help people in pain. It’s a value that we both share. However, each of us has values that are distinct and unique to the person that we are. Those values develop because you have had a certain type of life, certain types of experiences and influences that have influenced your values and to dovetail this or to keep it going into further and maybe deeper direction. I believe if you really key in to your values and you pay attention to them on the deepest level, it can lead you to whatever form of personal enlightenment you think is specific in your life. I do think that each of us is here to figure out what makes me the happiest and what makes me the most enlightened version of me. When you clarify your values on a really deep level and get specific about them then it will lead you to that path, whether you know it or not. What’s missing from pain care is the understanding of the contemporary pain science. It’s beautiful and that’s very yogi as well. Everything you say there sounds like a yoga scripture. I know you said once a month you have a worksheet but is there anything that you do daily? This is great for bringing it back to people that are listening because the third thing that is missing in pain care is value-based care. What do you do daily that helps you keep clear? You said sometimes you’re not even aware that you’re not acting in line with your values. Do you do daily practices or throughout the day what keeps you on track and in line with your values? One is in the morning, I sit down and I have this little handy worksheet, which is always on my desk. I list out the things that I’m doing for the day and the appointments I have and the reminders for myself. I check reference them not at all times, but often check or reference them next to some of my core values. I also have a very consistent meditation practice. If I meditate any less than twenty minutes a day, it’s probably a rare thing. I always meditate for 30 minutes a day. I was that person who could not wake up before the crack of dawn even if you pour ice water on top of my head. Now I wake up every day early and I do twenty to usually 30 minutes of various types of meditation that I believe keep me on track. Meditation is one of those things like pop culture right now. It’s everywhere. You can download all sorts of things online on YouTube. Some of them are junky and some of them are good, but I do think meditation is one of the most powerful tools we have for people with pain. They are one of the most powerful tools that we have to relieve stress. They’re also one of the most powerful tools that we have for you to contemplate and reflect on yourself and what you’re up to in your life and to reflect on how you’re doing as a human being. When I look around, I think we have a lot of awesome people on this planet. We have a lot of people who don’t sit back, reflect, and contemplate on the things that they say and do and how it relates to people’s well-being on a very superficial as well as very deep and profound level. I love this conversation and it’s so important. My daily meditation practice as well keeps me grounded. Even that stillness tries to keep me as clear as I can and then help us act in line. It helps with making choices in line with those values and being the best version of ourselves. I’m going to see Eckhart Tolle. I saw him before here in New York City. I saw here at the Beacon in New York City. Just so you’ll know he’ll over-deliver and he’ll stay on for probably 40 minutes longer than he should. It’s super fun. He sits there on a chair and he talks to you. I’ve been following his work for a while. It’s that intense presence, which is part of everything that we’re talking about and this is so valuable for everybody listening too. When I was there, you could feel every eyeball on him and all the energy just on the stage, but the amazing thing is that as you feel the energy going toward the stage, he just reflects it back at you. He’s so present at every moment throughout the entire talk. He doesn’t waver for one moment. He’s humorous and kind at the same time. He’s a natural teacher. He’s definitely an embodied equanimity. He is just like you, Shelly. I have been speaking to Shelly Prosko. She is a wonderful physiotherapist or we call it physical therapist here in the United States as well as a professional yoga therapist. You can find out everything about her by going to www.PhysioYoga.ca. You can visit Shelly on this podcast or podcast number one because she was on the first podcast. You can compare notes and see what she has to offer. Tell us about some of the great courses you have for clinicians, practitioners and people with pain. For the practitioners, since we’re talking about integrating yoga into your pelvic health practice, I have a brand new online course. The online course is for any healthcare practitioner, fitness professional, yoga teacher, yoga therapist, any movement specialist or body worker that wants to learn more about the pelvic floor and how to integrate yoga into enhancing pelvic floor health with their clients or even addressing some pelvic floor health issues. That can be found on my site. Then, of course, I have a video. I’ve got some video practices that are great for the general population and people who may be suffering from persistent pain or chronic pelvic pain, and those are on Vimeo. Everybody can have a discount. It’s 10% off of those Vimeo videos. There are yoga practices to increase your connection too and awareness of your pelvic floor and to help relax the pelvic floor and to facilitate engagement of it in a functional way. Those videos are on Vimeo and the 10% off code is ClientDiscount10. Of course, you can find everything at PhysioYoga.ca. I want to thank you, Shelly, for being here on another episode of the podcast. I definitely want to have you back on and talk about compassion and we’ll do that. It will be fun, I can’t wait. I’m going to do a little bit of pub med research before we go into that one. There’s some controversial or conflicting stuff too which makes it exciting. I know it exists in a lot of mental health care, but we need to bring it more into PT care for pain definitely. Of course, at the end of every podcast, I ask you to share this out with your friends and family. Make sure to share this podcast out on Facebook, Twitter, LinkedIn, wherever you’re social with your friends and family. I want to thank all of you for being here with me and for the little WOW Chat that we had. I’ll see you next week on the podcast. Shelly is dedicated to actively promoting the integration of yoga into healthcare by inspiring, empowering and educating health professionals, yoga practitioners, students and people in pain about ways yoga can be used safely and effectively to address a variety of health issues and improve quality of life. Please visit www.physioyoga.ca for more information.